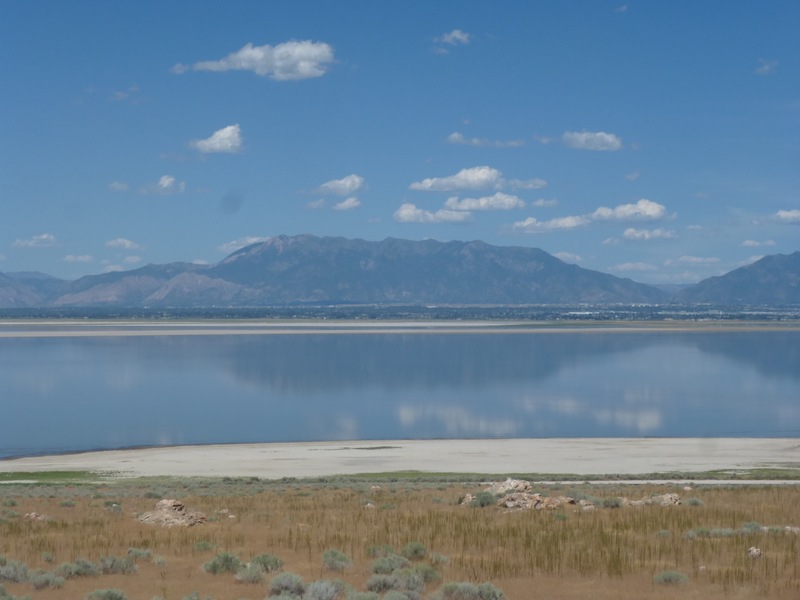 I have to admit before coming here I knew virtually nothing about the Great Salt Lake. I’m not sure I even knew it was in the State of Utah. But I can now happily admit that my mind has been blown by this astonishing natural feature, sitting contently in the middle of the vast land mass that is America, so very far from any kind of sea! I have since discovered that it is 75 miles long and 28 miles wide, the biggest lake in the United States that isn’t part of the Great Lakes range further north. I was confused as to how a body of water this far from the sea could be an actual salt lake, so being the curious English tourists we are, we asked someone! The lake has no outlet other than evaporation, and is fed by 4 major rivers which tumble down to it from the mountains. Just like rivers flowing in to the sea, these carry huge amounts of rocks and minerals containing salt, which remains in the lake when the water evaporates. Due to the sheer quantity of salt arriving in this lake, and the fact that it is so much smaller than the sea, the salinity is vastly higher than that of the sea, 7 X to be precise. 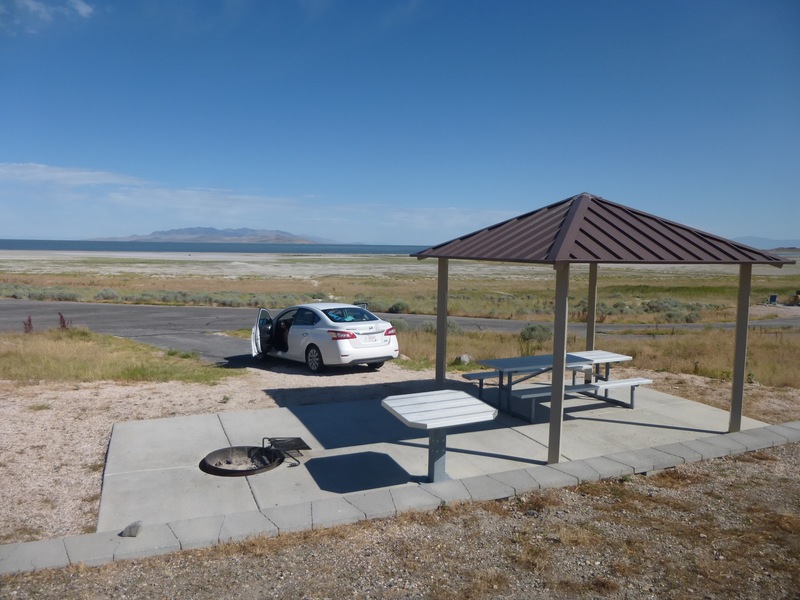 We had to test this out, so after a bit of research we headed for Antelope Island, the biggest of the lake’s 10 islands, for a couple of nights. Utterly stunning would be one of the many ways to describe it here and would still not come close to doing it justice. To access the island you drive across a long, purpose built causeway, with the salt flats rolling away on either side. We came across various tourists pottering round at the visitors’ centre, but predictably enough, as soon as we left to explore the rest of the island we were pretty much on our own. The Bridger Bay campground had arguably one of the best views of any I’ve ever stayed on, and provided 2 of the most relaxing days I’ve ever had; a feeling I very much cherish. There’s something rather magical about swinging in your hammock, reading a book in the sunshine, with wildlife and the gentle lapping of the lake as the only sounds. So, back to the Salt Lake. For starters the temperature of the water was 28 degrees, not much like the sea in any way (and certainly not in the UK!) It was shallow for a long time so one has to wade out quite a distance to get above knee deep, but yes indeed, once you immerse yourself and take your feet off the bottom you do in fact float in any position you wish to try! It’s difficult to describe, but it’s one father weirdest feelings I’ve ever had. You just float! Imagine sitting in a pool on a lilo, happily floating around, but there’s no lilo. I feel like it is what astronauts must feel like. You can simply barrel roll round and round without even a hint of sinking. You can happily swim along using just your arms, legs just floating out behind you. We couldn’t get enough. Plus, if you scrub your skin whilst in the water, once you’re out and blasted clean with cold water, you feel like you’re skin’s been born again. People pay a lot of money for exfoliating skin treatments that make you feel like that! I can’t recommend it enough, it’s one of the most unusual and most enjoyable experiences I’ve ever had. 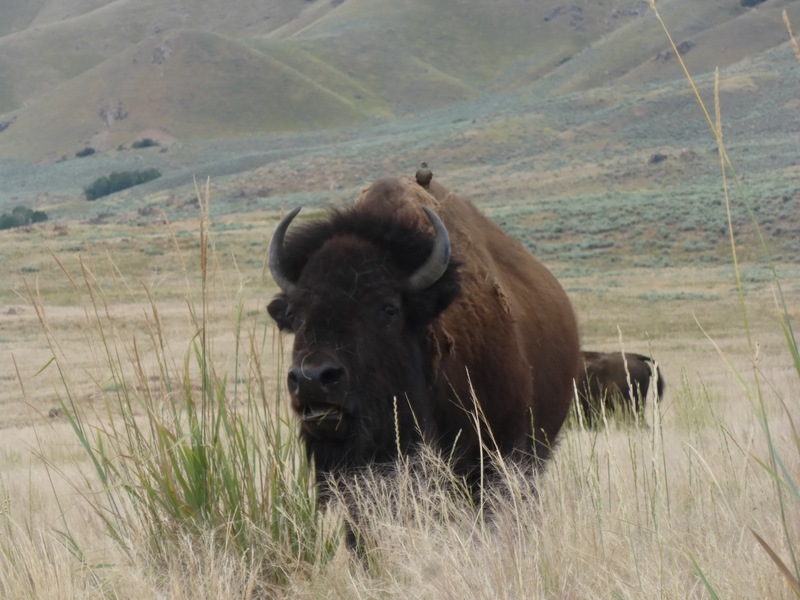 During our time on this island we’ve also had the opportunity to see close up; bison, antelopes, wild deer, eagles and wild hare. Hard to knock. 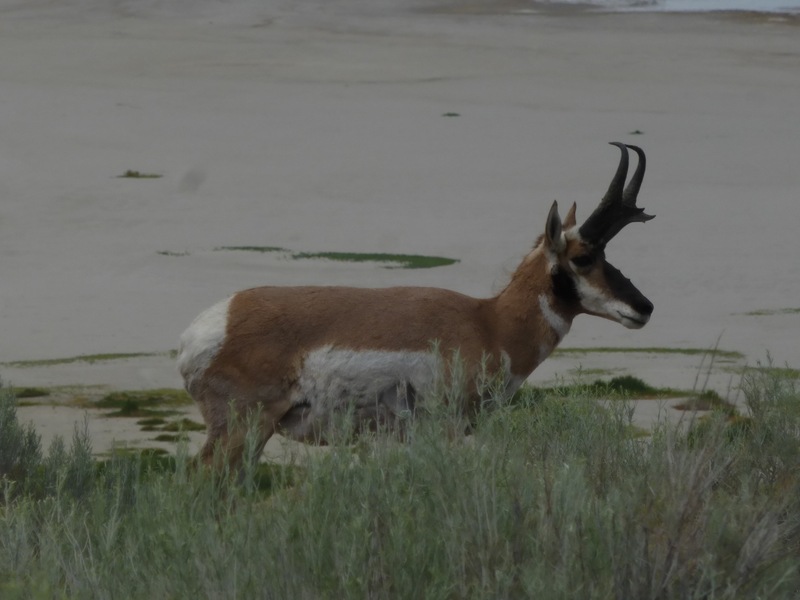 Antelope Island will be tough to leave behind, but we’ll be back, I’m sure of it! A wild bison, what cool animals!